There's a touch of Alan Bennett in Nichola McAuliffe's new play Maurice's Jubilee at the Edinburgh Festival, writes Dominic Cavendish. I’m not sure why, but there’s a lot of death and dying in the theatre at this year’s festival. While the Olympics is all youth and vigour, the Fringe is letting autumn leaves come falling down a month early. There’s a frightfully solemn and sentimental two-hander at the Traverse – And No More Shall We Part – about a husband and dying wife bidding adieu to each other as she sloshes down a few euthanasia “peaceful pills”. Over at the Pleasance, by far more watchable contrast, in Maurice’s Jubilee a dying husband is preparing for his 90th birthday and final weeks but not before he has reminisced some more about the night before the Coronation when he danced attendance on the young Elizabeth. Sound far-fetched? Well, he was an army man and a diamond specialist, so was entrusted with the crown jewels. And there’s more: according to Maurice, she promised she’d look him up one day. Poor fool him? His brain cancer affecting his mind? Maybe it’s more fool us. Nichola McAuliffe is a terrific actress and here proves herself a more than promising playwright. There’s a touch of Alan Bennett in the spry wit she brings to the suburban set-up – with post-crash financial hardships lending some topical grit (“Do you remember when we had steak and never thought twice about it?”). 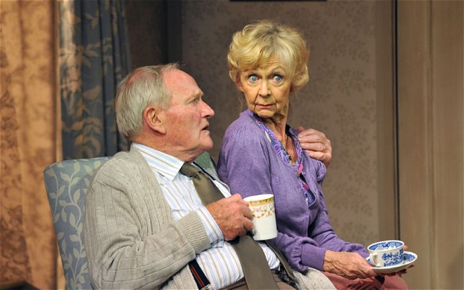 Julian Glover’s one-foot-in-the-grave Maurice is equal parts old charmer and stubborn goat and you almost sympathise with Sheila Reid’s Helena in her eye-rolling exasperation. But as he rehearses his cherished memories in front of McAuliffe’s kindly palliative-care nurse, his rekindled delight holds you in thrall, and you see both him and yesteryear England at its best. A longer life for the play looks a must. "Julian Glover and Nichola McAuliffe nominated for Best Actor and Best Actress for Maurice's Jubilee"
"Nichola McAuliffe is the first performer to win Best Actress at The Stage Awards for Acting Excellence at the Edinburgh Festival Fringe for the second time." "Top of my list for cool"
“Eddie Marsan’s performance as Richard is exemplary". This is more than just a curiosity... there is plenty here to tempt the jaded appetites of those who have consumed too many Hamlets. A cabaret atmosphere is sporadic... it does add to the production's strong sense of nostalgia for the past and melancholy for the future. (Director) Jameson pulls off his cross-gender casting. But beyond the artistic experiment, this Hamlet, positioned between two world wars, is in essence a plausible anthem to doomed youth. “The coarse but genuine spirit of enjoyment that permeates the company helps them communicate their complicated comic plot with welcome clarity"
“Known for their innovative productions and committed to making the Bard’s plays accessible to all Wild Thyme enjoys a high profile in Germany, and on the basis of this production a similar one here. Another successful production by Wild Thyme making Shakespeare fun and more accessible"
Stephen Jameson's adaptation ... about the world's best-known Dane is a bit like finding yourself in a familiar room where the furniture has all been changed around. Not only does Jameson play tricks with the words and relocate some of those big speeches, but he has also cast it entirely with women... it has plenty going for it: there is a freshness about it, as if changing the gender of all the protagonists has helped to jettison much of the cultural baggage surrounding Hamlet.